Most villages in France lure you in with enticing glimpses of a church steeple, visible from afar across green rolling hills. Not Conques! It is only as you descend into the village that the towers of the magnificent Abbaye de Sainte-Foy rise up to greet you. 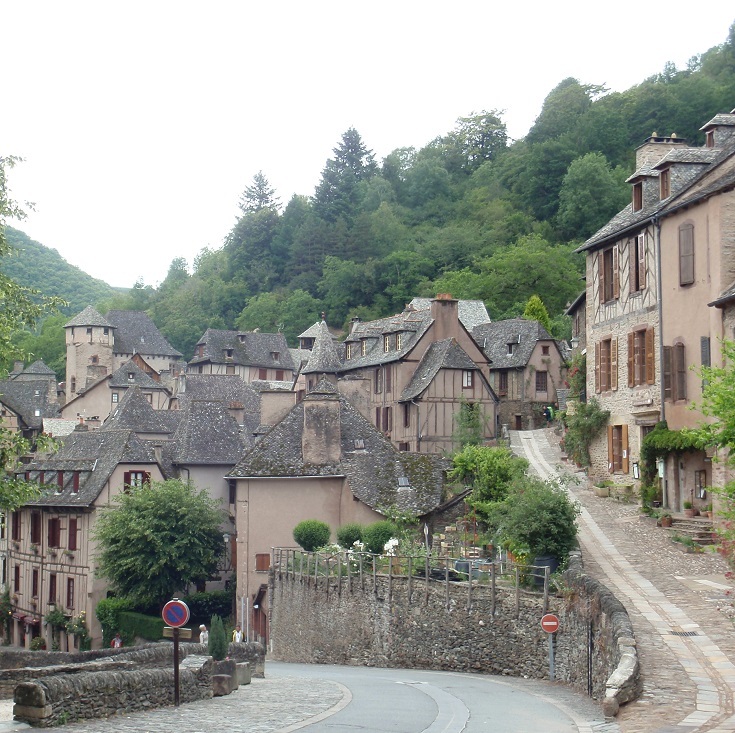 This is the first of many unforgettable moments in Conques—the third, and last, of the most beautiful villages on the walk from Aumont-Aubrac to Figeac. Continue down the hill a little further and take some time to visit inside the abbey. This is the resting place of the relics of Sainte-Foy, a thirteen year-old girl who was martyred in 303 AD in nearby Agen for her refusal to denounce her Christian faith. After the initial decree that she be burned alive on a metal grill resulted in a public outcry, Foy (pronounced Fwah) was thrown into prison with other Christian supporters. Still, she refused to deny her faith and was beheaded, alongside her fellow prisoners. 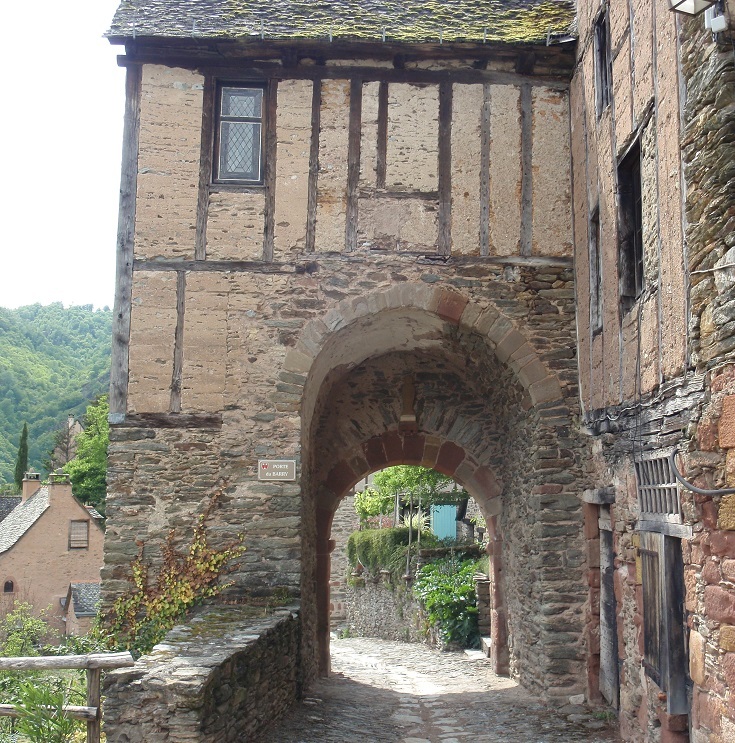 In 866 AD, the relics of Sainte-Foy were ‘borrowed’ from the abbey in Agen and brought here to Conques, where a new church was built in her honour. 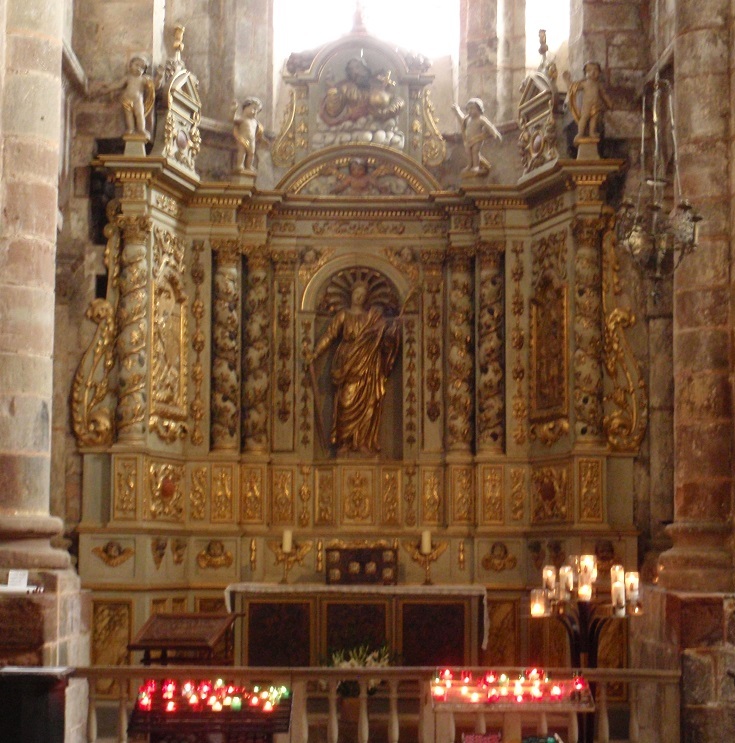 The relics bestowed much prestige on the village, which has been an important stop on the pilgrimage to Santiago de Compostela ever since. A more detailed account of Foy’s life is provided in a small booklet Saint Faith by Frère Jean-Régis Hamel, which is available from the gift store next to the abbey. The book highlights sculptures and other symbolic references to the martyr that are located inside the church and is a handy guide to have with you when you visit the abbey. It would be a shame to rush through Conques without exploring all the delightful nooks, crannies and back streets which wind their way around the abbey. 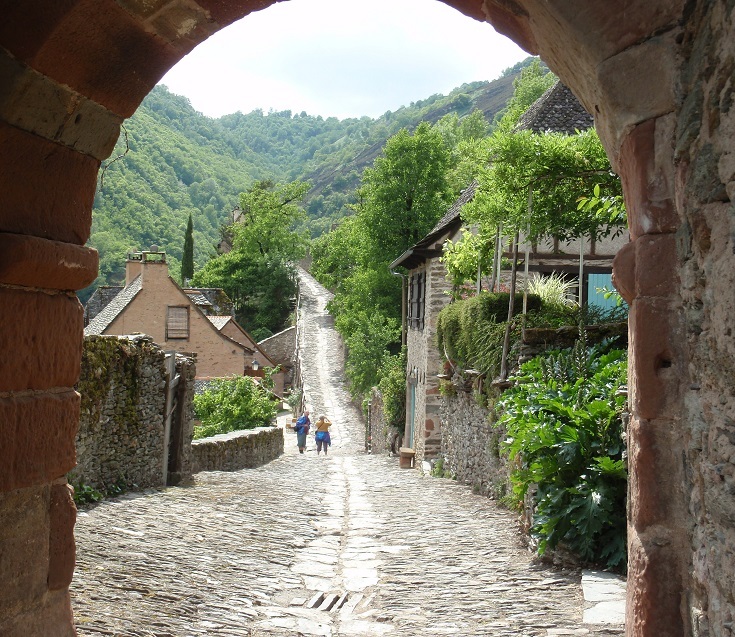 Call in to the Tourist Office and pick up a copy of the marked map of the village—Step by Step Through the History of Conques—to guide you around. Be sure not to miss the cloister and Treasury, which is filled with precious relics from the Middle Ages. Guided visits are also available in English from the Tourist Office, as are night tours of the Tribunes in the abbey. 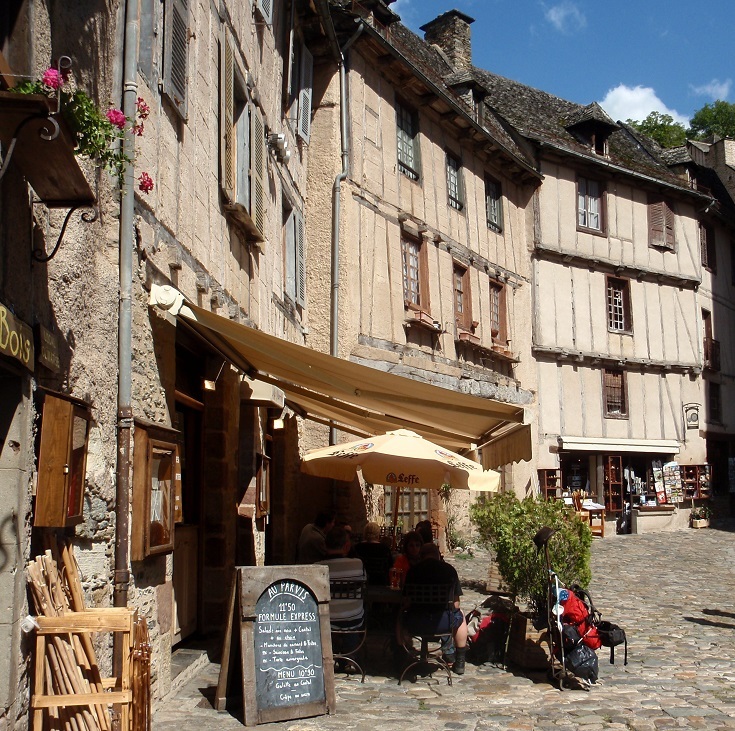 There are several cafés and restaurants in Conques and deciding where to eat is a difficult task. For stunning views of the abbey, it’s hard to go past the cafés in Place de l’Eglise. Relax over a leisurely lunch and admire the contemporary stained-glass windows by local artist Pierre Soulages. Reward yourself tonight with a Michelin-starred meal at le Moulin de Cambelong on the far edge of the village. Hervé Busset serves dinner here every night except Monday (NOTE: the restaurant is open from 7 pm until 9 pm which is quite early by French standards). Vespers are held in the abbey to welcome pilgrims every night at 6.30 pm. 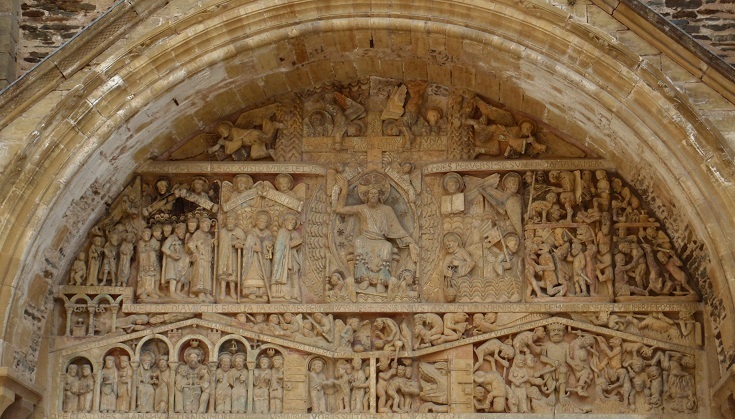 After the service, everyone gathers outside where a priest tells the story of Sainte-Foy and Saint-Matthew, depicted in the twelfth-century tympanum above the entrance. Despite understanding almost nothing of what was said (it was en français), I found this a captivating experience (and now that you know a little of Sainte-Foy’s poignant story, you’ll be well able to follow along!). 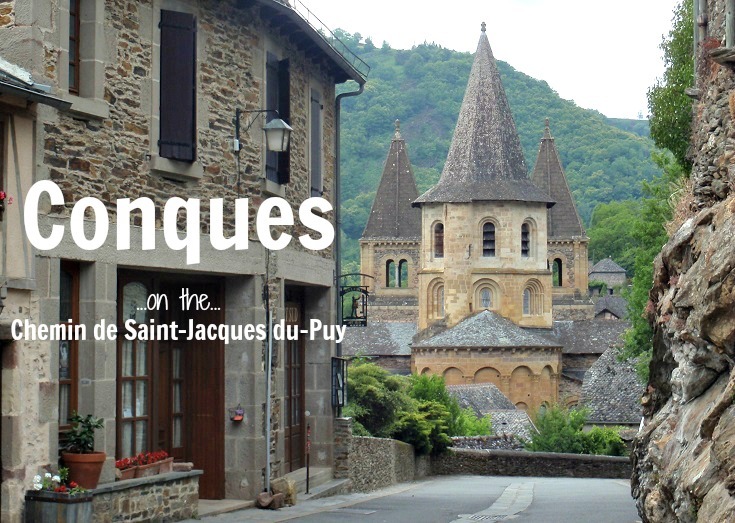 Many walkers who have started out from Le-Puy-en-Velay or Aumont-Aubrac and plan to complete their journey along the Chemin de Saint-Jacques in stages, take advantage of the transport links in Conques and finish their walk here. 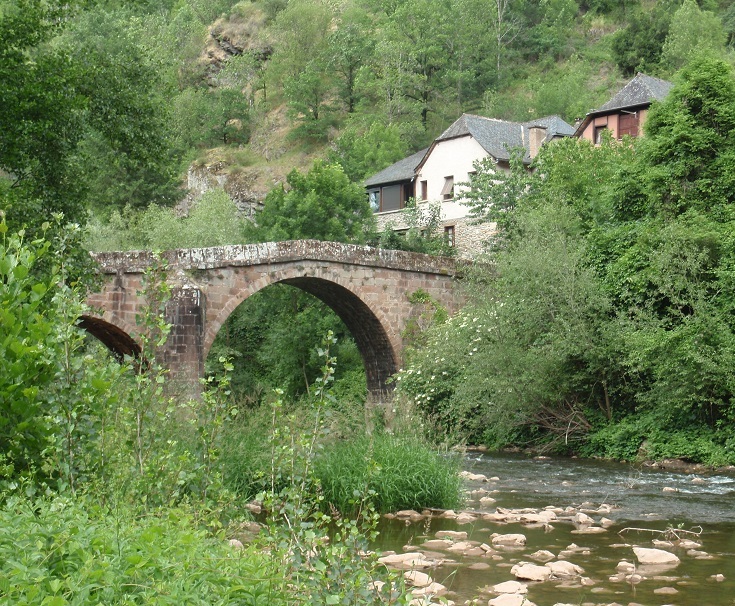 If you decide to do the same and not continue your walk towards Figeac, be sure to venture just a short way further along the Chemin de Saint-Jacques to the roman bridge at the edge of the village. The path will take you under Porte de Barry, one of the original entrances to the village. It’s fun to imagine, hundreds of years ago, a guard keeping watch over the pilgrims and merchants coming and going. 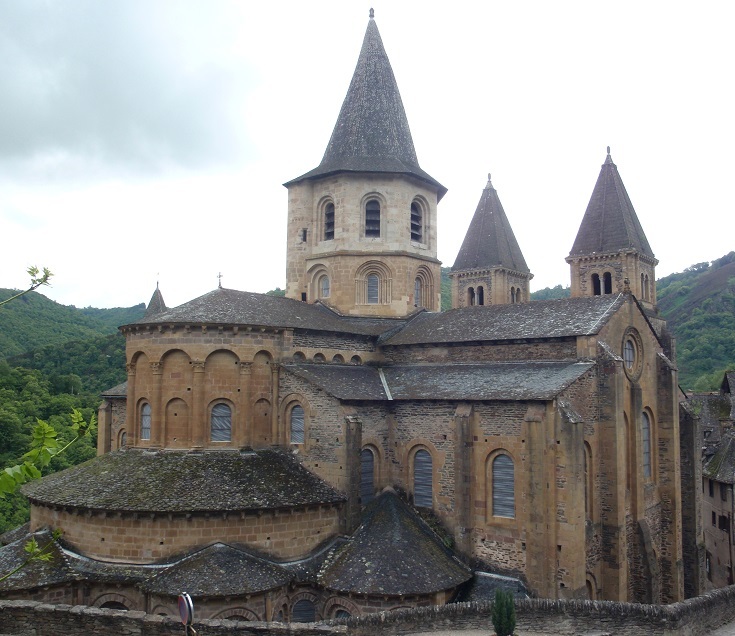 Which long-distance walk visits Conques? Conques looks like like a great little village. I don’t know how you can return to “normal life” after walking in France. I would not be able to adjust. It’s hard to adjust back Eduardo and always takes me a long time! I like the sense of perspective in the last shot, Melinda, and seeing what lies ahead during the journey.